Senior Noah Umura draws contact while driving through two defender. His tenacious presence in the paint helped South Pasadena compete in the second half. South Pasadena's record fell to 3-6 in league. 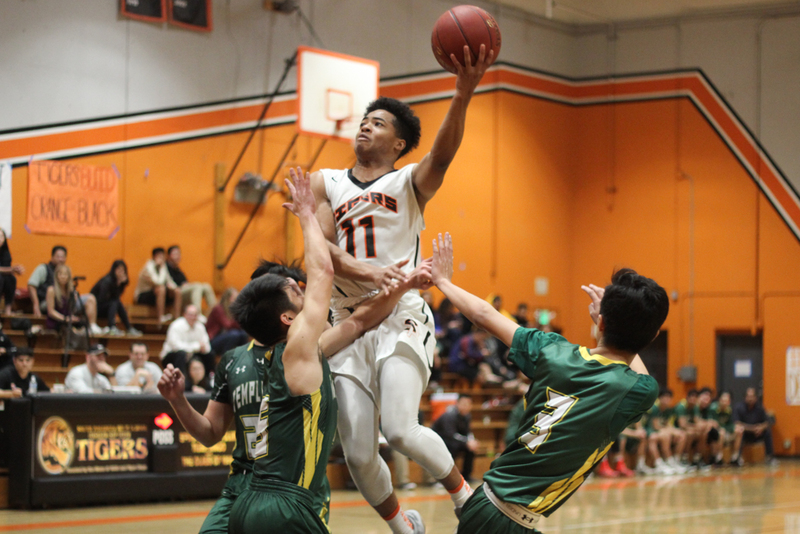 A second-half surge by the Temple City Rams eliminated hopes of a CIF berth for boys’ basketball on Tuesday, February 6, as the Tigers’ penultimate league matchup on Senior Night ended with a 51-40 loss. Lackluster offensive efforts defined the vast majority of the first two quarters, as both teams combined for a measly 28 points. Halftime adjustments resulted in resurgence for South Pas and Temple City, but the Rams’ superior attack in the final moments enabled them to climb out on top. The disappointing loss drops the Tigers’ overall and league records to 11-15 and 3-6, respectively. Senior Jaylen Park turns the corner on a defender while hurdling down court. Numerous South Pas stops on defense in the first quarter stemmed from quality communication and quick switches, as cohesive movement forced two Ram turnovers on two possessions. The Tigers were dominant in the paint, a refreshing change from past league matchups. Seniors Reno Goudeau, Noah Uemura, and Ben Kent were incredible near the basket, constantly grabbing rebounds and starting/extending possessions. 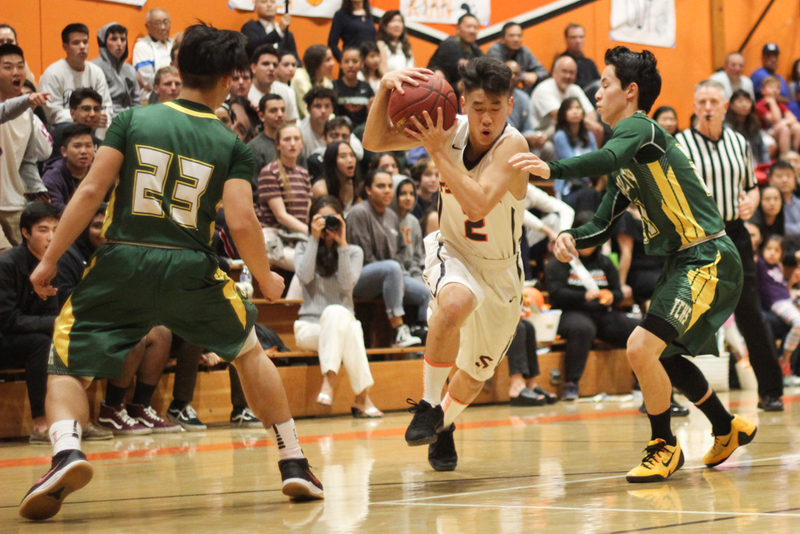 Despite these advantages, South Pas was unable to gain command of the game, as it took the first half of the opening period for three baskets to be scored. As a result, each basket held major significance and ignited the crowd; senior co-captain Nick Corvino nailed a fade, before fellow senior co-captain Danny Rios finished in transition to give South Pas a 6-4 lead. The period ended with a 8-4 score, and closed the window of opportunity for the Tigers to grab an early, commanding advantage. Defenses loosened their grip on the game in the second quarter, but several offensive opportunities were still missed by both sides. Baskets continued to be few and far between, as several shots by Corvino and South Pas players rattled in and out. The shooting performance by the Tigers was incredibly unfamiliar, and allowed Temple City to stay in the matchup. 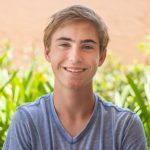 The Rams nearly grabbed a lead in the waning seconds of the half, as a Temple City player threw up a full-court shot that miraculously found its way through the hoop. Unfortunately for the Rams, the basket was disallowed, as officials ruled the shot was released after the buzzer. The half finalized with a 14-14 tally. The opening possessions of the second half foreshadowed an offensive explosion, as Corvino knocked down a pair of triples and Rios swished a three. As the pace increased, the audience grew more involved, frequently shouting “Go go go” as players sprinted down the court. The physicality also intensified, with the animosity between the two squads reaching a climax as senior Jaylen Park exchanged words with a Ram after a hard foul. Tempers flared and shoving ensued, and senior Ben Kent came to the defense of his teammate. Coach Ryan Lee and the South Pas bench pulled players away from the scrap with hope of avoiding technicals and ejections. This effort was ultimately fruitless, as Park was assigned a technical and Kent was ejected. Uemura replaced Kent, and showcased his prowess as he gathered the rebound of his own shot and powerfully finished the play. However, Temple City utilized a last-second three to grab a 30-28 lead at the end of the quarter, leaving a single, eight-minute quarter to decide whether South Pas’ CIF hopes would be extinguished. Temple City entered the final period with a vengeance, as the Rams built a seven-point lead in the opening minute. South Pas substituted, looking to disrupt the Rams’ rhythm, but that attempt was unsuccessful. Temple City utilized a three to extend its lead to 45-32 with 3:15 remaining, prompting a desperate South Pas onslaught. Unfortunately, the Rams were able to hold the Tigers at bay, and close out the game with the 51-40 score. Boys’ basketball will travel to Blair on Thursday, February 8, for its final league game at 7:00.